From the New Zealand Garden Journal (Journal of the Royal New Zealand Institute of Horticulture), Volume 5, Number 2, December 2002, pp. 2-5. In this, the 2002 Banks Memorial Lecture, I have two main aims. First, I will trace what has been discovered by botanists about the Mt Taranaki/Egmont flora since Joseph Banks scanned the mountain from the deck of Cook's Endeavour in 1770. Second, I will discuss some of the results of my own garden and natural experiments, conducted in more recent times. 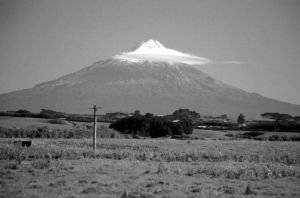 The landscape that has been the setting for this work is the sequence of linear (NNW to SSE) volcanic activity known as The Taranaki Volcanic Succession. Volcanic activity began at Paritutu and the Sugar Loaf Islands near New Plymouth 1.75 million years ago and was followed by the genesis of Kaitake, Pouakai and Mt Taranaki/Egmont, 575,000, 250,000 and 70,000 years ago, respectively. My research has focused on the plants growing on these three, progressively younger volcanoes. Each has its own distinctive features: each is in effect a small but distinct botanical district. Nearly all of the landscape covered with indigenous vegetation is within Egmont National Park (Figure 1). Figure 1. Mt Taranaki/Egmont, the most recent volcano of the Taranaki Volcanic Succession. It is fitting that my topic for the Banks Memorial Lecture has a direct link to Joseph Banks. As a botanist I can easily imagine how frustrating it would have been for Banks to see the mountain from the deck of the Endeavour and yet not be able to go ashore and investigate its botanical treasures. Banks did observe "many white lumps in companies of fifty or sixty together, which probably were stones or tufts of grass, but bore much resemblance to flocks of sheep". It is most likely those were hummocks or patches of the Racomitrium mosses that are still a feature of the debris flows on the upper western slopes of the mountain. But unfortunately Banks never had the opportunity to botanise on the ground. The first European to describe plants on the mountain was Ernst Dieffenbach, naturalist to the New Zealand Company. His contribution is still commemorated in the name of Kelleria [Drapetes] dieffenbachii, the dwarf native daphne found in the alpine zone. James Buchanan, a surveyor and botanist, followed in 1869 and recorded 180 vascular species on a journey from New Plymouth over the Pouakai Range to the northern slopes of Mt Taranaki. Leonard Cockayne, the internationally renowned plant ecologist, made several trips to Mt Taranaki and listed some 220 vascular species. Oliver (1931) was the first to publish evidence of the recent eruptions, describing the presence of scoria lodged in large trees near Stratford, and Maori ovens (umu) beneath recent ash layers. However, the most significant contribution to understanding the flora of the Egmont National Park was made by the late Anthony (Tony) Druce in a series of publications between 1953 and 1976. Tony more than doubled the number of vascular species known within the park (to 440), quantified the extent of "missing" taxa (460) and clearly established the significance of recent eruptions in determining vegetation composition. My interests in the native flora began as a child growing up "under the mountain". Between 1961 and 1973, I established and maintained a small native plant garden in the front lawn of our homestead. My mother's exotic bedding plants and shrubs were removed and replaced by a native plant collection, including many species collected from the higher slopes of the mountain. These first garden experiments helped me to identify plants and observe their phenology and behaviour at close hand. This was the foundation for much of my later research. Between 1975 and 1977, for my Master of Science thesis I focused more on natural experiments following the approach advocated by Pielou (1977): "Because natural zonation (which can be thought of as a natural experiment) is so ecologically informative, it is worthwhile to seek it out even in places where it would not automatically be expected". Such places include the margins of wetlands, sites of major disturbance or change in topography. I documented and explained changes in vegetation structure and composition with increasing altitude, and changes in species interactions relating to slope. I continued with the natural experiment approach for my Doctor of Philosophy research between 1978 and 1981. This time I focused on variation in vegetation structure and composition around the cones, and understanding eruption effects on vegetation, especially at the treeline. Results showed how the treeline composition related to the direction and depth of recent ash showers, especially the Burrell eruption of 1655 AD. A small suite of tree species, kamahi (Weinmannia racemosa), kaikawaka (Libocedrus bidwillii), broadleaf (Griselinia littoralis) and Hall's totara (Podocarpus hallii), are found in various different combinations at different treeline sites depending on past eruption effects. The distinctive goblin forest (kamahi-Hall's totara forest) of the main Egmont cone at Dawson Falls, Stratford Mountain House and near the North Egmont Visitor Centre also owes much of its character to the impacts of recent eruptions (Figure 2). Figure 2. 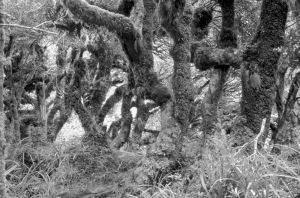 Kamahi (Weinmannia racemosa) dominated goblin forest at North Egmont. From 1981 to 1992, while working for the Department of Scientific and Industrial Research in Rotorua, the main emphasis of my research turned back to common garden experiments. This included growing a wide range of North Island natives to test hypotheses about species status particularly in Hebe, Coprosma, Melicytus and Olearia. Turning to the current statistics on the flora of the Egmont National Park, we now know that at least 550 indigenous vascular species occur here. The magnitude of the vascular flora of the park is now very well known. I am aware of only four new listings to the park flora since the 1980s. A recent exciting discovery was the threatened native milfoil (Myriophyllum robustum). Progress has been made in understanding the status of many of the species in the park, but several problems remain. I will discuss some examples that I have worked on, recognising that this is not a comprehensive discussion. Celmisia provides a continuing problem, especially the taxa belonging to the C. gracilenta/graminifolia complex. Celmisia major var. brevis may or may not be part of a widespread species complex, and perhaps could be distinct only at a subspecies level. However, more DNA sequencing research will be required to test this hypothesis. Similarly, the status of the rhizomatous bog Celmisia on the Pouakai Range requires resolution. The largest Celmisia recorded in the park, C. semicordata (= C. coriacea), is doubtfully native. It occurs on the main cone at one isolated site and was probably planted there. Hebe also remains problematic although its resolution seems more imminent than in Celmisia. 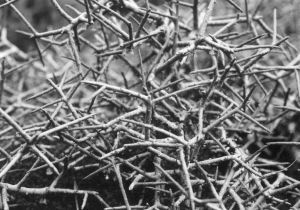 The common subalpine scrub species is named Hebe stricta var. egmontiana in the Flora Volume 1, but it is clearly a different species to H. stricta, having double the chromosome number (2n = 80). At present it should be referred to as Hebe sp. unnamed (H. "egmontiana"). Hebe subsimilis var. astonii which occurs only on Pouakai could possibly be a variety of the more widespread Hebe tetragona complex, but in cultivation it retains its more delicate growth form and is not as drought tolerant as true H. tetragona. Hebe odora has two distinct forms in the park. The common form occurs mainly in tussock grassland and subalpine shrublands on both the Egmont and Pouakai cones, but on the Pouakai tops there is a prostrate form that retains this character in cultivation. Other variants occur elsewhere, on North Island mountains at least, and resolution will require more detailed comparison before a decision about its status can be made. One taxon previously considered an Egmont endemic, Ourisia macrophylla subsp. macrophylla, has lost this status, having been found on the Herangi Range some 120km to the north. The everlasting daisy (Anaphalioides alpina) of the alpine zone of Egmont and many other mountains has at last been recognised as distinct from the more widespread A. bellidioides. Of the five or six species still considered to be Egmont endemics, only one has been fully resolved. This is the unusual divaricating shrub of the Ahukawakawa Swamp, Melicytus drucei, named in honour of Tony Druce (Figures 3 and 4). The story behind this species has to be one of the most interesting and intriguing of all the plants in Taranaki. Melicytus drucei is a permanent odd polyploidy (triploid) with a chromosome number of 2n = 48. Its putative parents are M. flexuosus (a diploid; 2n = 32) and M. aff. alpinus (a tetraploid; 2n = 64). Neither putative parent occurs in the park or nearby. It is necessary to speculate on a comparatively recent origin, perhaps during a period when harsh climatic conditions prevailed in the region, and when the two putative parents were more widespread. Figure 3. 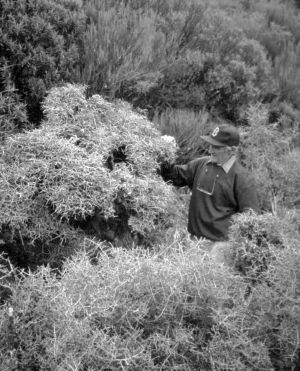 Melicytus drucei shrubs on the margins of Ahukawakawa Swamp (Dr Brian Molloy as scale). As already noted, approximately 460 species found elsewhere in the North Island, and which might be expected to occur in Egmont National Park, are "missing". The well known species include the beeches (Nothofagus), but others include tawheowheo (Quintinia serrata), a tree which has seeds well adapted for wind dispersal, and which is abundant on other west coast volcanic cones such as Pirongia. The long history of disturbance and isolation of the Taranaki mountains from other high ground are probably major reasons for the depauperate flora, as well as the exceptional abundance of kamahi and leatherwood (Brachyglottis elaeagnifolia) over large areas of the park. Five taxa common in the South Island have their only North Island occurrence in the park. These vary considerably in abundance, the extremes illustrated by the alpine shield fern (Polystichum cystostegia) and mountain lacebark (Hoheria glabrata). Alpine shield fern can be found in the alpine zone on Egmont, but the mountain lacebark has so far completely eluded me. This tree was found in the 1960s by Tony Druce and Geoff Kelly while measuring the forest composition on a transect line near the old North Egmont Chalet. Despite intensive searching by colleagues and myself it has not been seen for more than 40 years. Figure 4. Close up of Melicytus drucei showing divaricating growth form and diminutive flowers. Approximately 30 taxa have very localised distributions in the park, being found in only one or two places, usually in low numbers, and therefore particularly vulnerable to local extinction. The bog mingimingi (Androstoma [Cyathodes] empetrifolia) is a classic example, a clump of plants occurring at only one place on the crest of Pouakai. Conservation and protection of the park's flora remain significant challenges for the future. Possums will require ongoing control to ensure the forests remain in good health, especially since the kamahi dominated stands are probably predisposed to mass dieback, having extensive even-aged cohorts relating to volcanic disturbance events. At present there is apparently no effective alternative to aerial poisoning using 1080, especially in the difficult terrain of the montane, subalpine and alpine zones. The conservation benefits by far outweigh the risks. Goats are now under control since reaching plague proportions in the 1960s, and thankfully deer and pigs have never been a significant problem. Most of the weeds that have invaded the park to date are rather benign by national and international standards. However, ongoing surveillance will be required to ensure the forests especially are protected from invasive shade tolerant shrubs, trees and lianes cultivated in lowland gardens, which have not yet naturalised. The indigenous vegetation protected within the park is not representative of the full range of diversity once characteristic of the Egmont Ecological District. There are still some prospects for developing lowland corridors of forest especially by protecting the riparian margins of some of the larger rivers and streams such as the Manganui, Hangatahua and Oakura. But even in these supposedly environmentally enlightened times, there have been notable, albeit rare, examples of ecological vandalism such as the clearance of the regionally important swamp forests of waiwaka or swamp maire (Syzygium maire) on Norfolk Road. In parts of the North Island, community groups are contributing to the gathering "Green Renaissance" by adopting reserves and supporting the management agencies in their restoration efforts, for example the Maungatautari Ecological Island predator proof fence project. In Hamilton City, where almost all the indigenous vegetation and habitat was destroyed in the last 100 years, an innovative project to reconstruct from scratch examples of the Hamilton basin ecosystems at Waiwhakareke (Horseshoe Lake) seems likely to proceed. Again, a predator proof fence will enable not just the plants to flourish, but the return of many threatened birds and other fauna. New Plymouth City is much better endowed with bush remnants and reserves. It has the National Park close at hand and a comparatively long tradition of incorporating indigenous plants into gardens and parks. But the challenge for the people of Taranaki in the future will be to adopt a broader vision that reconstructs some of the missing elements of the original diversity linking the mountains to the sea, and by riparian planting and protection to the city. Consideration will also need to be given to predator proof islands, which will enable restoration of at least some portions of ecosystems to their original status. This approach surely would have met with the approval of the renowned patron of science and botany, Sir Joseph Banks. Bayfield, M.A. and Benson, M.A. (1986). Egmont Ecological Region. Survey report for the New Zealand Protected Natural Areas Programme. New Zealand Protected Natural Areas Programme. No. 2. Wellington, Department of Lands and Survey. Buchanan, J. (1869). Notes on the botany of Mount Egmont and neighbourhood, New Zealand, February 1867. Journal of the Proceedings of the Linnean Society of Botany 10: 57-62. Clarkson, B.D. (1977). Vegetation change along an altitudinal gradient, Mount Egmont, New Zealand. MSc thesis, University of Waikato, Hamilton. Clarkson, B.D. (1980). Present day vegetation. In: Tullett, J.S. ed. Egmont National Park Handbook. 4th edition. New Plymouth, Egmont National Park Board. Pp. 68-77. Clarkson, B.D. (1981). Vegetation studies in the Taranaki Land District, New Zealand. Unpubl. DPhil thesis, University of Waikato, Hamilton. Clarkson, B.D. (1985). The vegetation of the Kaitake Range, Egmont National Park, New Zealand. New Zealand Journal of Botany 23: 15-31. Cockayne, L. (1917). Egmont botanical field notes. Unpublished notes, Ms. 74, Auckland Institute and Museum Library, Auckland. Cockayne, L. (1922). The plant life of Mount Egmont. In: Mount Egmont. Issued by the Egmont Mountain Club. Hawera, Ekdahl Print. Pp. 6-12. Cockayne, L. (1928). The vegetation of New Zealand. 2nd edition. Leipzig, Englemann. Dieffenbach, E. (1843). Travels in New Zealand. Two vols. London, John Murray. Druce, A.P. (1953). Plant distribution records (1). Wellington Botanical Society Bulletin 26: 20-22. Druce, A.P. (1956). Plant distribution records (3). Wellington Botanical Society Bulletin 28: 10. Druce, A.P. (1961). Mountain vegetation of the North Island. New Zealand Soil News 3: 95-107. Druce, A.P. (1964). The vegetation. In: Scanlan, A.B. ed. Egmont National Park Handbook. 1st edition. New Plymouth, Egmont National Park Board. Pp. 41-56. Druce, A.P. (1966). Tree-ring dating of recent volcanic ash and lapilli, Mount Egmont. New Zealand Journal of Botany 4: 3-41. Druce, A.P. (1970). The vegetation. In: Scanlan, A.B. ed. Egmont National Park Handbook. 2nd edition. New Plymouth, Egmont National Park Board. Pp. 45-59. Druce, A.P. (1973). Checklist of the higher plants of Mount Egmont including Pouakai and Kaitake ranges (from sea-level to the summit). Third approximation November 1973. Unpublished checklist, Botany Division, DSIR, Lower Hutt. Druce, A.P. (1974). Some notes on the flora of Mount Egmont. Auckland Botanical Society Newsletter 31(2): 1-4. Druce, A.P. (1976). The vegetation. In: Fullarton, J.H. ed. Egmont National Park Handbook. 3rd edition. New Plymouth, Egmont National Park Board. Pp. 39-50. Druce, A.P. (1976). Egmont botanical studies. In: National Parks Series 6. Wellington, National Parks Authority. Pp. 53-57. Glenny, D. (1997). A revision of the genus Anaphalioides (Asteraceae:Gnaphalieae). New Zealand Journal of Botany 35: 451-478. Molloy, B.P.J. and Clarkson, B.D. (1996). A new, rare species of Melicytus (Violaceae) from New Zealand. New Zealand Journal of Botany 34: 431-440. Oliver, W.R.B. (1931). An ancient Maori oven on Mount Egmont. Journal of the Polynesian Society 40: 73-80. Pielou, E.C. (1977). Mathematical Ecology. New York, Wiley. Dr Bruce Clarkson is Associate Professor and Director of the Centre for Biodiversity and Ecology at the University of Waikato. Bruce has had a lifelong interest in growing and researching native plants and has published more than 40 papers on various aspects of the systematics and ecology of native plants and vegetation. He has also written or co-authored several books including Vegetation of Egmont National Park, Botany of Rotorua, Gully Restoration Guide and Botany of the Waikato.